Tired of hearing all the hype about Pinterest’s advertising platform, Promoted Pins? Maybe you’ve even considered launching your own campaign but held off to see if it’s worth the investment. Pinterest advertising is gaining steam. Now is a good time to see how these Promoted Pin campaigns can move your business forward. In fact, Pinterest is expanding the Promoted Pins option internationally. You can now run campaigns from the UK. We are anticipating other countries are on the horizon. More importantly, our users have recounted their results as, “Stinking awesome.” Quite an endorsement if we say so ourselves. Well, we’re here to encourage you to throw your hat into the ring. Don’t worry. We wouldn’t advise doing anything that we don’t do ourselves. We continually run our own campaigns to increase brand awareness and lead generation. That’s probably not a surprise as we continually proclaim that Pinterest is the most robust and effective social media platform around. The good news is that we are opening our playbook to showcase the best practices and tips for running your first Pinterest advertising campaign. In order to run a campaign, you have to have a business Pinterest account. If you have a personal account, you can easily convert it to a business account. You’ll keep all your boards and followers. This unlocks the ability to use Pinterest analytics, rich pins, link your account to your website and run campaigns. Before starting your campaign, we highly recommend confirming your website on Pinterest. This is particularly important if you chose engagement campaigns. Long term the benefits keep adding up for having your website verified, even if you don’t use Pinterest advertising. “Engagement campaign: Pay when people engage with your Promoted Pin (closeup, repin and click). You should run an engagement campaign if your primary goal is to reach a wider audience on Pinterest. Think of Engagement Pins as a strategy to reach people early on in their buying process. Pinterest is the perfect platform for “future intent,” or for creating recognition with clients who are not ready to buy today. This campaign creates brand awareness, boosts account engagement and gets your content in front of more users. While verifying your URL with Pinterest is considered best practice, it’s even more important when launching an engagement campaign. When you have a verified URL, each pinner who interacts with your ad will get a notification to follow your boards. All engagement with your other pins is a free byproduct of your campaign. Traffic campaigns are designed to reach people ready to act now. They are more expensive but better at driving targeted traffic to your website, selling a product, moving customers into your sales funnel or capturing an e-mail with a lead capture. When running a traffic campaign, it’s important to use super targeted traffic suggestions. That’s a great question, which we’ll cover in-depth in the next section. But it’s not the most important question. Before launching any advertising campaign, it’s essential to have specific and measurable goals. This not only influences which type of promoted pin you use, it also defines how you will evaluate how successful the campaign is. Once you have a clear picture of what you want to accomplish with your campaign, and which type of promoted campaign you want to use, it’s time to move into selecting pins that are going to drive results. Pinterest has specific guidelines on what you are allowed to promote. First, know that you can only promote your own content that is on a public board. Hopefully it’s pretty obvious why promoting content on a secret board might not be the best use of your money, and why Pinterest doesn’t allow it. This also means that you can’t promote other account’s pins. For example, you can’t promote an affiliate that has an excellent pin highlighting how awesome your product is. Pinterest has specific guidelines on the type of content you can promote. You’re not allowed to promote gifs, videos, or images with prices or discounts. They also prohibit certain products, such as tobacco, weight loss pills or online gambling. You can check out Pinterest’s advertising standards here. Pro pinner tip: If you want pricing information to show up in your promoted campaign, use a Rich Pin that has the price embedded into the description. Phew! Glad we got all of the logistics out of the way. Now to the good stuff, the pins you can, and want to, promote. As a general starting point, it’s a good idea to promote a pin or blog post that has already done well. There’s no use investing into a pin that doesn’t resonate with your audience. Our Tailwind dashboard can help you evaluate which content has performed best and which pins to avoid putting money into. For future campaigns, we suggest that you organically pin related content one to two months before you start your paid campaign. This gives you the ability to gain some initial traction, determine which pins are worth investing into and make the most of the organic traffic before hand. If all of this seems a little overwhelming, don’t despair! We created a robust, yet easy to use, content calendar. This resource outlines suggestions on the type of content you should be pinning, promoting and creating each month of the year. It’s the calendar you wished you had when you first heard of Pinterest. Grab our FREE content calendar here. On the Pinterest toolbar in the right-hand corner there is a button with a +. Click on that and scroll down to “Create ad.” If this is your first time, Pinterest will walk you through several initial questions. Once you finish the slideshow, you will arrive at the ads dashboard. Here you select either an Engagement Campaign or a Traffic Campaign. Once you select the campaign type, you will need to enter the campaign details. This will include outlining the date range and the lifetime budget or daily budget. The next step is to select your pin. Pinterest will auto populate this screen with a selection of your pins. They have different filters, such as “30-day most repinned,” to help you select. You can also search for a specific pin by URL. Audiences are a brand new addition to the Pinterest’s Ads dashboard. This allows you to specifically target an email list or an audience similar to your email list (called a lookalike audience), or retarget people who have visited your webiste. This is a more advanced tool, so unlesss you have an email list already built up then you can skip this step. We recommend including a few relevant Interests. This helps your ad populate when users browse through the interest selections. Interests are broken into broad categories. Make sure to expand the sub-categories and deselect any that don’t apply to your business. If you have predetermined keywords, you can copy and paste those into the keyword section. Keywords help narrow in on your audience and we recommend using no fewer than 30. You can research keywords through Google’s Keyword planner. The last targeting options are locations, languages, devices and gender. Pick the selections that mirror those of your target demographic. The final section on the “Add more details” section is the “Maximum bid.” This is where you tell Pinterest the most you want to pay for a click or engagement, depending on your campaign type. Once you enter a number, Pinterest will tell you if it is a low, good or strong bid. Underneath the bidding box you will see a suggested price range. If it’s not there when you start, enter in a number. It will pop up once it registers your bid. We recommend choosing a bid in the middle. As you become more proficient with your ads, you will be able to pinpoint a better range for your unique demographic. There are some campaigns where we maximize our budget by going below the recommended bid as well as other times where we need to be a stronger bid. It’s more of an art than a science. You can monitor throughout the life of your campaign to adjust as necessary. If you find that you aren’t using your entire daily budget, it’s likely one of two reasons. First, review your pin to ensure that it is attractive, will captivate your audience, and has all of the hallmarks of a great Pin. If you are sure that you have a strong pin, it’s time to up your maximum bid. Often times when we have a pin performing well, maxing out the daily budget, we move our maximum bid down a little. We then wait to see if we are still able to maximize our budget. We wouldn’t leave you without your most powerful asset when running ads. Yes, these are the numbers, metrics, and analytics. Any marketing campaign isn’t worth its salt if you can’t tell how you did. In the Pinterest ads dashboard, you can see how many clicks, engagements and impressions you received. If you are running multiple campaigns, you can also evaluate which pins are performing better. We also have tools to help you determine your website traffic numbers from Pinterest. This helps you track what is working. Now that you have all the data, it’s time for the big question. Was your campaign successful? Many pinners want to know industry standards or what to expect for each bid range. To be completely honest, it varies dramatically by industry, targeted audience, and interests. 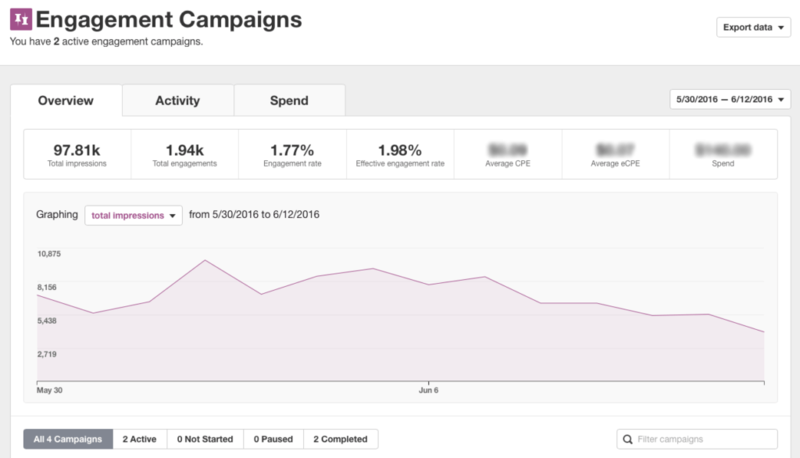 There isn’t a cut and dry template to measure your campaign against. We suggest you measure against yourself, evaluating your campaign against your goals. At the end of the day, success is as variable as your unique goals for the campaign. Did you drive more unique visitors to your website? Did you capture more e-mail addresses? Did the campaign help grow your business or bottom line? When you use that as a measuring guide, you’ll be able to use promoted pins to drive success for your unique business. The CPC really confuses me…do I really have to pay 2.00 per person who clicks through?? That seems insanely expensive to me. Am I missing something? ?